When a chef is creating a meal, he or she might use what is called a reduction. In the culinary world, a reduction is a good thing. It brings out the flavors and makes a dish more robust. Having covered the LDI Show for over 15 years, I would like to pull that culinary term out to describe what I witnessed just last week in Las Vegas. There was a reduction in the size of the show, but the quality overall has really gone up with new real players like Epsilon and Core vying for positions in the market and a cut of the buyers dollar. Their first year in the LDI Show, Epsilon had a few of the resident lighting companies checking over their shoulder watching as Epsilon is handed the 2014 Best Product Presentation Award for debuting several dozen new audio and lighting products at their booth in an attractive and informative display. Phil Lantini beamed with excitement over the award knowing they could be a driving force in the DJ and club world much like they are in the car audio world. New this year was the addition of an EDM section that LDI, in conjunction with popular UK DJ publication, BPM created. It placed a huge focus on the electronic dance music market. A place were massive amounts of lighting mixes with the ever popular EDM scene. This is a major change for the LDI Show that once was just a show for dealers and lighting installers. Taking a page from the NAMM playbook that started offering entry directly to end-users five years ago with their Hot Zone to prop up sinking numbers, the LDI Show EDM experiment did not appear to fair as well as the NAMM Hot Zone attendance has over the years. This could be due to its lack of promotion and advertising as the DJzone newsroom first heard about it a month prior to the LDI show opening. Some great news for Martin DJ fans is that they are making a comeback into the DJ lighting world with their RUSH line. The new PR-1 is in production and LED powered. A Mania line is planned and they currently have two moving heads in the lineup. The anchor companies for LDI are well known in the DJ world. 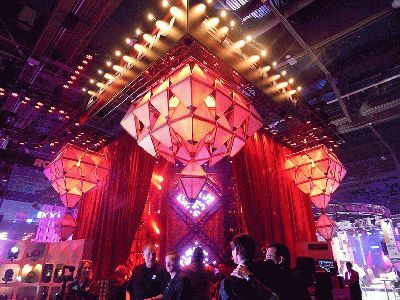 CHAUVET, Omni Sistems, ADJ, Martin and Elation all had a huge presence with everything from a couple to dozens of new products on display. CHAUVET DJ released most of their new products in August, but they still had a couple of newsworthy pieces to show. The GigBar IRC is an out of the bag Mobile DJ lightshow that includes color and movement, with a stand to put it on. It includes two pars for color, two derby type lights for movement, four strobe lights and a laser. All in one compact package with a controller. Also on display, CHAUVET DJ had their Fun Fetti confetti cannon that will give you 30 seconds and 30 feet of confetti. All in all, the "reduction" of the LDI Show was a positive thing for both the vendors and the attendees. Most all the vendors told us that traffic stayed pretty constant on Friday and Saturday and the scaled back floor gave those attendees more time to take in the educational track and offerings, while still getting to see the most important new lighting up close and personal.